Heaven’s Best of the Albemarle Elizabeth City NC serves the greater Albemarle Area including Hertford and Elizabeth City offers carpet cleaning, rug cleaning, upholstery cleaning, and more! ” Our carpet cleaners give you the best value and we are confident that Heaven’s Best is the only carpet cleaning company you need. Call to talk to your local carpet cleaning technician to find out which cleaning service is best for you. They can answer your questions and schedule an appointment. Heaven’s Best Carpet Cleaning Elizabeth City NC has been steadily growing in North Carolina since 1990. 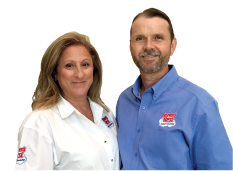 Terry and Paula Cowart now operate the 15th Franchise in the state and serve the six Northeastern Counties in the Greater Albemarle Area. Recently retired from the Coast Guard, Terry and Paula lived in the Elizabeth City area for a total of 12 years during their career and now claim this area as home. Terry and Paula pay meticulous attention to every detail and are committed to bringing you the best possible service. Whether they are cleaning carpet, upholstery, tile and grout, hardwood, commercial floors, HVAC ducts or dryer vents, they will be on time and guarantee great results every time. Heaven’s Best Carpet Cleaning Elizabeth City NC is part of the international franchise started by Cody Howard in 1983. Heaven’s Best was started because a need was seen for a different type of carpet cleaning. One that none of the other competitors were trying. The Heaven’s Best method uses a low-moisture technique to allow your carpet to dry in one hour. This takes away the pain and hassle of waiting hours or even days for your carpets to dry. Loved the way the carpet looked and the clean fresh smell that lasted into the following week. Terry even came back and help clean up an accident that happened after the cleaning. Great group to work with. Very prompt and courteous service. My only complaint would be that it took closer to 6 hours to dry. But as long as it's well done I'm happy. I'm very pleased with the job that Terry and Jonathan did. My carpet looks great! Stains are gone, too! They are very professional and explain the process. I recommend them highly. I am so amazed how beautiful my carpets are now! They look brand new again! I have never had the results like I experienced with Heaven's Best! It really did dry quickly and smell fresh and clean. The service was excellent!